Take out your frustrations on stress relieving dolls. When things have got you down, try the old stuffed doll stress relief method. These dolls can be used to vent your frustration on, without hurting anyone. There are several types of stress relief dolls on the market as well as ones you can make for yourself. What is Old Stuffed Doll Stress Relief? Old stuffed doll stress relief is a method of getting rid of your stress by transferring your anger to an inanimate object. It can make people feel better simply by tearing it to bits, smacking it around, or hitting it until the stuffing comes out. While it may seem violent to some, the act of venting anger on something other than a real person is an effective method of stress relief. It may even make people laugh as they realize how silly it is beating up on an old stuffed doll. There are many types of stress relief dolls on the market that can be "punished" in various ways. They may be drawn upon to resemble a specific person or have a picture of a person stuck on the front of the doll. The dolls may not even resemble anyone in particular and may just have a silly looking face. No matter which type of doll is chosen, they all have the same effect. Draw a pattern of a simple doll shape on paper. The thicker the limbs, the easier it will be to sew. Use this pattern to cut out two identical doll pieces from the scrap material. Places the pieces with the outsides facing each other and sew together, leaving a 1 inch space on the body for an opening for the stuffing. Using the opening, pull the doll inside out and stuff. Hand-sew the opening shut. Sew on the eyes and sew on a few strands of yarn for hair. Once the doll is finished, smack the doll around when you're angry while yelling, "Dammit, dammit, dammit!" Do you ever want to tear something limb from limb, but you just don't have anything handy? Consider the tear-apart stuffed doll. These dolls may be fashioned into any person that causes anger. For example, a referee who makes bad calls, a grumpy boss, or even an ex-lover. The head, arms and legs are attached with Velcro making it easy to pull apart (and put back together) the object of your anger. 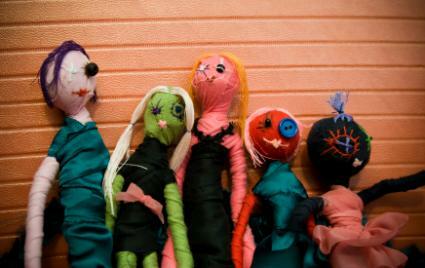 Probably one of the oldest types of dolls to vent your stress upon are the old voodoo or hoodoo dolls. These can easily be found on the market in the southern United States and on the internet. The purpose of these dolls is to serve as the object of your anger. They can be dressed like the person you don't like, drawn upon and even made anatomically correct. These dolls are usually poked through with pins in places on the dolls body where you want the actual person to hurt. While these dolls may have no real effect on the person you're angry with, they certainly provide a small measure of satisfaction to the person sticking the pins in the doll.